This master property management, leasing, and construction management agreement is for the engagement of a professional management firm to supervise the operations of a large portfolio of income producing properties on behalf of the owner. The agreement is pro-owner in tone, and specifies the duties of the manager in detail. The manager is required to collect rentals, perform the duties of the landlord under the leases in the portfolio, conduct building inspections, perform necessary maintenance, make expenditures consistent with approved budgets for the properties, hire needed personnel, handle banking matters, supervise accounting, and so forth. The manager is also responsible for supervision of construction on the properties. The property management fee to be paid to the manager is a percentage of the gross monthly income. The manager is also paid leasing commissions and a construction management fee. The agreement also sets forth in considerable detail the construction services the manager must provide during the term of the engagement. Features The manager is required to perform property management services for the portfolio of income producing real estate. The manager is also responsible for leasing of the properties and for supervision of construction on the properties. 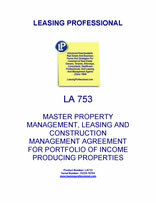 This Master Property Management, Leasing and Construction Management Agreement (“Agreement”) is made and entered into as of the ____________ day of ___, 20__, by and among COMMERCIAL PROPERTY OWNER, a ____________ corporation (“ Owner ”), and COMMERCIAL PROPERTY MANAGER, LLC, a __________ limited liability company (“ Manager ”). Owner intends to retain Manager to manage, coordinate the leasing of, and manage construction activities related to, certain real estate properties acquired or held for the benefit of Owner under the terms and conditions set forth herein. 1.1. “Affiliate” of another Person includes only the following: (i) any Person directly or indirectly controlling, controlled by, or under common control with such other Person; (ii) any Person directly or indirectly owning, controlling, or holding with the power to vote 10% or more of the outstanding voting securities of such other Person; (iii) any legal entity for which such Person acts as an executive officer, director, trustee, or general partner; (iv) any Person 10% or more of whose outstanding voting securities are directly or indirectly owned, controlled, or held, with power to vote, by such other Person; and (v) any executive officer, director, trustee, or general partner of such other Person. 1.2. “Improvements” means buildings, structures, and equipment from time to time located on the Properties and all parking and common areas located on the Properties. 1.3. “Lease” means, unless the context otherwise requires, any lease or sublease made by Owner as landlord or by its predecessor. 1.4. “Ownership Agreements” has the meaning set forth in Section 2.3.B hereof. 1.5. “Person” means any natural person, partnership, corporation, association, trust, limited liability company or other legal entity. 1.6. “Properties” means all real estate properties owned by or held for the benefit of Owner and all tracts acquired by Owner in the future containing income-producing Improvements or on which Owner will construct income-producing Improvements. 1.7 “Total Management Fees” has the meaning set forth in Section 4 hereof. 2. Appointment of Manager; Services To Be Performed. 2.1. Appointment of Manager. Owner hereby engages and retains Manager as the sole and exclusive manager of the Properties to perform such functions as are specified herein. Manager hereby accepts such appointment on the terms and conditions hereinafter set forth. It being understood that this Agreement causes Manager to be, at law, Owner’s agent with respect to the Properties but only for the limited purposes set forth herein upon the terms contained herein. Owner represents that it has authority to grant such agency power. A. Efforts of Manager. Manager agrees to perform its duties under this Agreement and to use reasonable commercial efforts to enhance the ability of the Properties to generate income. Manager’s services are to be of scope and quality not less than those generally performed by professional managers of other similar properties in the areas in which Properties are located. Manager shall make available to Owner the full benefit of the judgment, experience and advice of the members of Manager’s organization and staff with respect to the policies to be pursued by Owner relating to the management, operation, leasing, construction and/or buildout of the Properties. B. Ownership Agreements. Manager has received copies of agreements of limited partnership, joint venture partnership agreements, operating agreements, articles of incorporation and bylaws of Owner and its Affiliates (collectively, the “ Ownership Agreements ”), as applicable, and mortgages on all Properties and is familiar with the terms thereof. Manager will use reasonable care to avoid any act or omission which, in the performance of its duties hereunder, in any way conflicts with the terms of the Ownership Agreements or the mortgages in the absence of the express direction of the Owner, and Manager shall promptly notify Owner if any such conflict arises. A. Monies Collected. Manager will collect all rent and other monies from tenants and any sums otherwise due Owner with respect to the Properties in the ordinary course of business in accordance with the terms and conditions of all Leases and other agreements for the use and occupancy of the Properties, including any other charges that may become due at any time from any tenant or from others for services provided in connection with the use and occupancy of the Properties. In collecting such monies, Manager will inform tenants of the Properties that all remittances are to be in the form of a check, money order or wire transfer. Owner authorizes Manager to request, demand, collect and receipt for all such rent and other monies and to institute legal proceedings in the name of Owner for the collection thereof and for the dispossession of any tenant in default under its Lease. All monies so collected shall be deposited in an Account (as defined in Section 2.4.K(1)). Manager shall not write-off any income items without the prior approval of Owner. B. Lease and Mortgage Obligations. Manager will perform all duties of the landlord under all Leases insofar as such duties relate to operation, maintenance, and day-to-day management. Manager will also provide or cause to be provided, at Owner’s expense, all services normally provided to tenants of like premises, including where applicable and without limitation, gas, electricity or other utilities required to be furnished to tenants under Leases, normal repairs and maintenance, and cleaning and janitorial service. Manager shall use its commercially reasonable efforts to comply with the terms and conditions of all Leases and shall promptly advise Owner of any material breaches. Manager shall also perform all covenants and obligations required to be performed under the provisions of all mortgages, deeds of trust, deeds to secure debt or other like instrument to the extent that the performance of such covenants and obligations are within the day-to-day control of Manager or as may be requested by Owner. C. Building Inspections. Manager will conduct complete inspections of the Properties and the surrounding common areas and all of their mechanical facilities as is prudent to determine that the same are in good order and repair, but no less frequently than once per calendar quarter during the term of this Agreement; provided, however, that any Properties subject to triple-net Leases need only be inspected semi-annually. D. Maintenance. Manager will cause the Properties to be maintained in the same manner as similar properties in the area. Manager’s duties and supervision in this respect include, without limitation, cleaning of the interior and the exterior of the Improvements and the public common areas on the Properties and the making and supervision of repairs, alterations, and decoration of the Improvements, subject to and in strict compliance with this Agreement and the Leases. (4) maintenance supplies calling for an aggregate purchase price of less than $5,000. F. Notice of Violations. Manager will forward to Owner promptly upon receipt all notices of violation or other notices from any governmental authority, and board of fire underwriters or any insurance company, and shall make such recommendations regarding compliance with such notice as shall be appropriate. G. Personnel. Any personnel Manager hires to maintain and operate a Property shall be the employees or independent contractors of Manager and not of Owner. Manager agrees to use due care in the selection and supervision of such employees or independent contractors. Manager is responsible for the preparation of and shall timely file all payroll tax reports and timely make payments of all withholding and other payroll taxes with respect to each employee. H. Utilities and Supplies. Manager shall enter into or renew contracts for electricity, gas, steam, landscaping, fuel, oil, maintenance and other services as are customarily furnished or rendered in connection with the operation of similar properties in the area and shall order all necessary supplies and equipment required for the proper operation, maintenance and repair of the Properties. I. Tenant Complaints. Manager shall maintain business-like relations with the tenants of the Properties and respond to tenant complaints in a prudent, business-like manner. Manager shall maintain a record of all tenant complaints and Manager’s response to such complaints which record shall be available for review by Owner. J. Signs. Manager shall place and remove, or cause to be placed and removed, such signs upon the Properties as Manager deems appropriate, subject, however, to the terms and conditions of the Leases and to any applicable ordinances and regulations. (a) All sums received from rents and other income from the Properties shall be promptly deposited by Manager in an Account. All checks drawn to the order of Owner should be endorsed by Manager for deposit only and deposited in an Account. (b) Manager shall have the right to designate two or more persons who shall be authorized to draw against each Account, but only for purposes authorized by this Agreement. Manager may not under any circumstances write a check on an Account payable to or in favor of Manager or any Affiliate of Manager other than (i) to reimburse itself for expenditures made on behalf of the Properties, and (ii) to pay itself the Total Management Fees payable hereunder, provided that any such expenditure, reimbursement or fee shall be reflected in the monthly operating statement provided with respect to the month in which such expenditure or reimbursement is paid, and all proper procedures for payment have been followed. (c) All sums due to Manager hereunder, whether for compensation, reimbursement for expenditures, or otherwise, as herein provided, shall be a charge against the operating revenues of the Properties and shall be paid and/or withdrawn by Manager from an Account in accordance with the terms of the approved budgets or pro formas and to the extent funds are available therefor after taking into account other required expenses of the Properties; provided, that if Manager has received a notice in accordance with Section 7.1 that it is in default of any material provision hereof and has not cured such default within ten (10) business days, then Manager shall refrain from and be prohibited from withdrawing funds from an Account pursuant to this Section 2.4.K(1)(c) until such default is cured and Owner has consented to a normal resumption of the activity provided for in this Section 2.4.K(1)(c). In the event that Manager determines that there are insufficient funds in the Accounts for the Properties to pay sums due to Manager hereunder and to pay the other expenses of the Properties, then Manager shall notify Owner in writing and Owner shall promptly make sufficient funds available to satisfy such obligations. (d) Unless otherwise directed by Owner, by the 30th day of the first month following each calendar quarter, Manager shall forward to Owner net operating proceeds from the preceding quarter, retaining at all times, however a reserve for each Property provided in the budget as approved by Owner to meet unbudgeted contingencies. (2) Closing Bank Accounts. All items relating to bank account closings are to be coordinated through Owner. Manager is required to process cash activity in accordance with any applicable termination agreement, purchase and sale agreement, merger agreement, etc. Manager is responsible for final bank account reconciliation at the time of close out or transfer of the account.